What can I say about blazers that I haven’t said already? They are one of the more perfect articles of clothing in existence, as appropriate with jeans and a tee as they are with items far dressier. 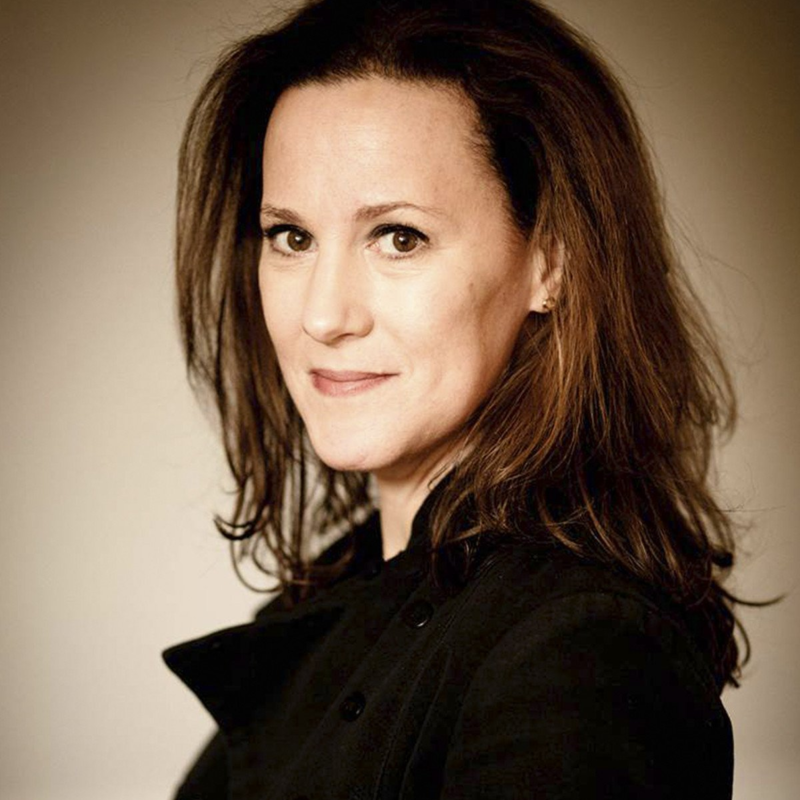 I like to wear mine with a button-down or graphic tee and sometimes layered over a thin cashmere hoodie. I’m not typically a huge fan of double-breasted versions—especially if the buttons are loud—but I do like this understated version a lot. 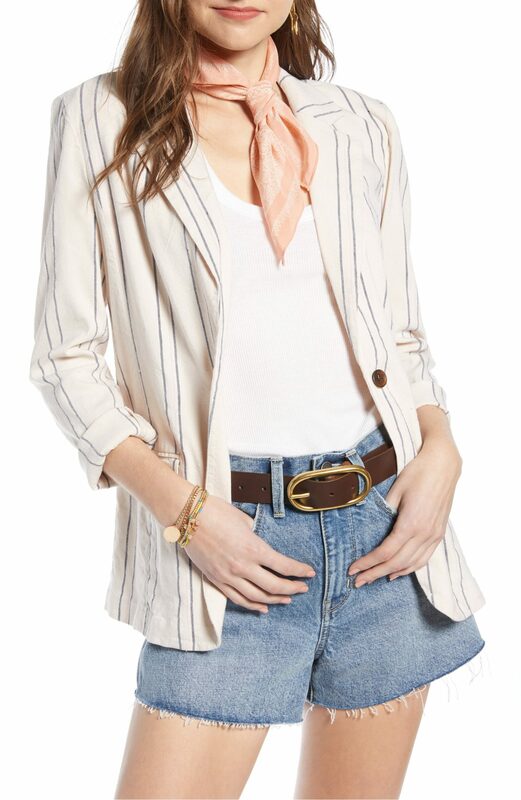 I would totally wear a corduroy blazer in a light color like this right now. 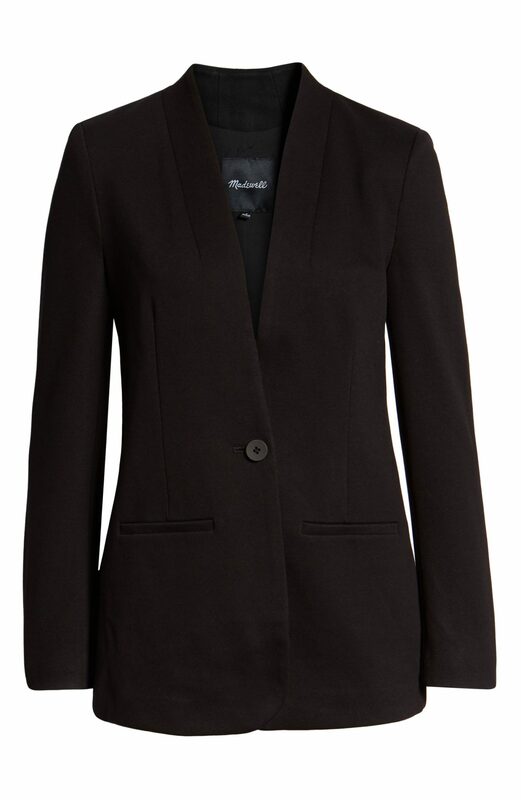 The charcoal hue of this Theory blazer is very nearly perfect. This is Veronica Beard’s School boy jacket, and it’s not too cheap, but I like the shrunken proportions like the shorter sleeves. I don’t know what this pattern is called—is it a check?—but I do think it’s a ton of fun. And I surprise myself by liking it, a little. I am so fond of this funky madras plaid jacket so much that I had to include it even though it’s only left in a few sizes. This notch collar number comes in several colors and rings in at under $100. 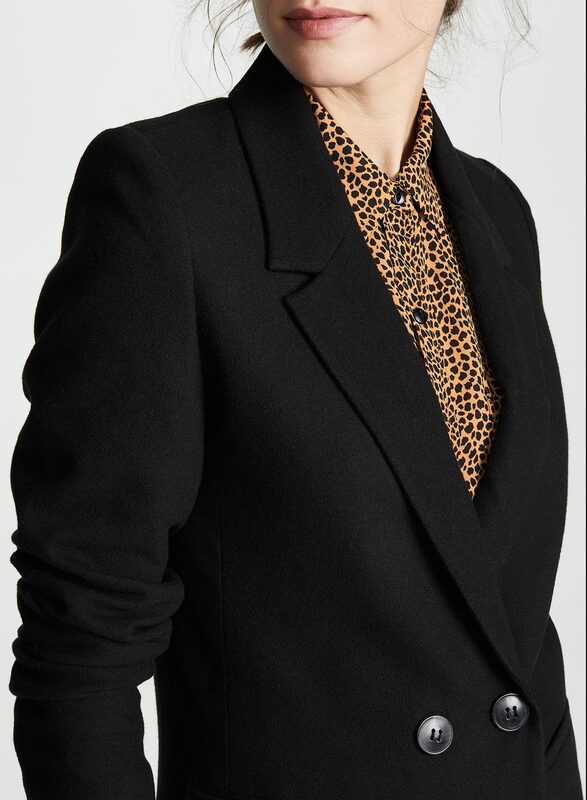 I’m pretty certain I’ve shown you this blazer before (my memory is a disaster) but I love everything about it: the cut, the collar, the pockets, the buttons. So much excellence rarely exists in the same item. 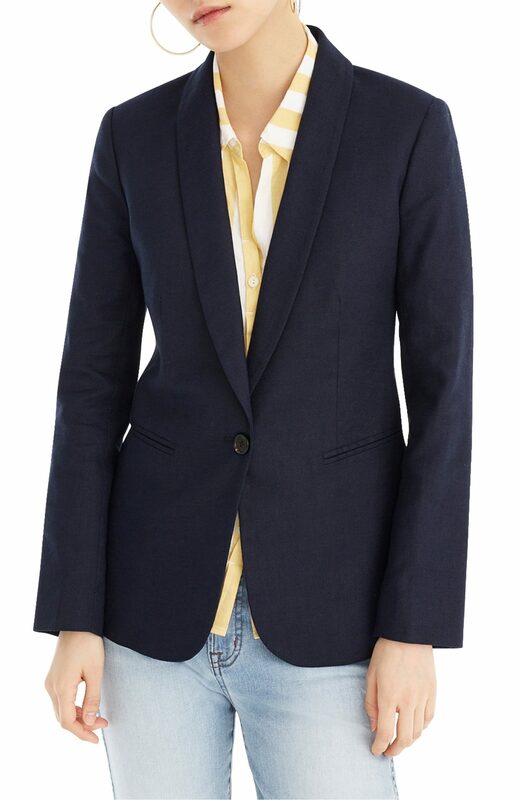 Another design detail I usually don’t go for is a lapel-less look, but this Madewell blazer is really polished. 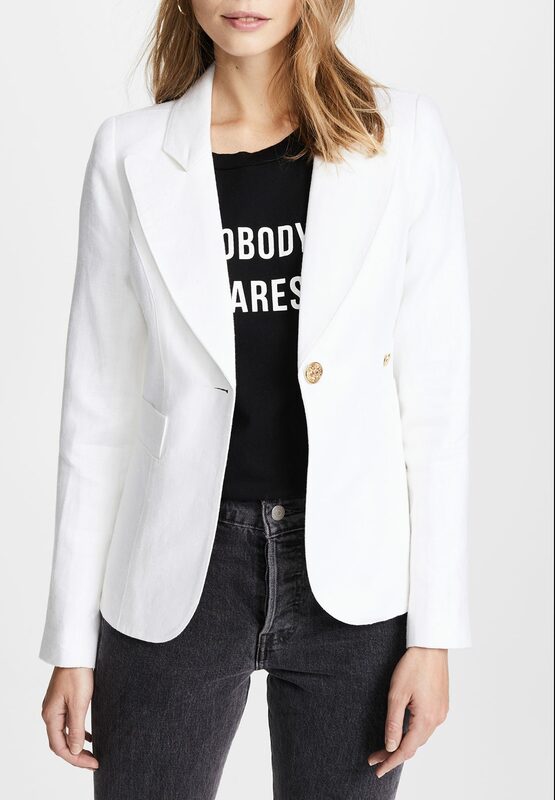 A white blazer worn just like this, over all black, is one of the best looks going. Here is a J. 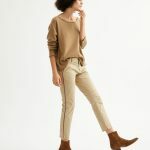 Crew stretch linen option that is so nicely understated. Another shrunken silhouette, this one is an excellently fiery red. 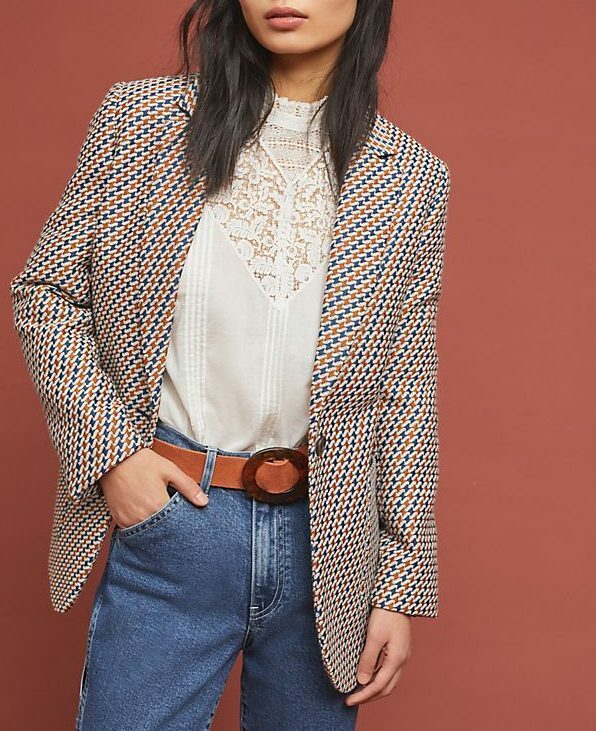 This reminds me of a shrunken Nili Lotan blazer I wanted last fall, but it’s much, much cheaper. Stripes are kind of a kick, and this one comes in pink too, if you’re feeling poppy. You could turn a silk blazer black tie-worthy with a perfect pair of black trousers and white silk shirt (or a cami if you’re feeling daring). What do you buy in multiples? Has anyone else here spent time there? I was in Kazakhstan four years ago in September (on holidays) – loved it. At the time, women in Almaty were quite dressy (no athleisure). But a great mix of styles. Regularly saw women walking together with some wearing traditional tunic/pants and others wearing blazer, jeans, heels. Beyond going with longer sleeves and no shorts, I’d say wear whatever makes you feel confident. I was in Kazakhstan four years ago in September (on holidays) - loved it. At the time, women in Almaty were quite dressy (no athleisure). But a great mix of styles. Regularly saw women walking together with some wearing traditional tunic/pants and others wearing blazer, jeans, heels. Beyond going with longer sleeves and no shorts, I'd say wear whatever makes you feel confident. The Price Per Wear of my 7+ year old grey jersey Max Mara Weekend blazer (almost like a sweatshirt material) is down to pennies. It’s looking dingy but I can’t part with it. It’s perfect. How will I ever replace it? 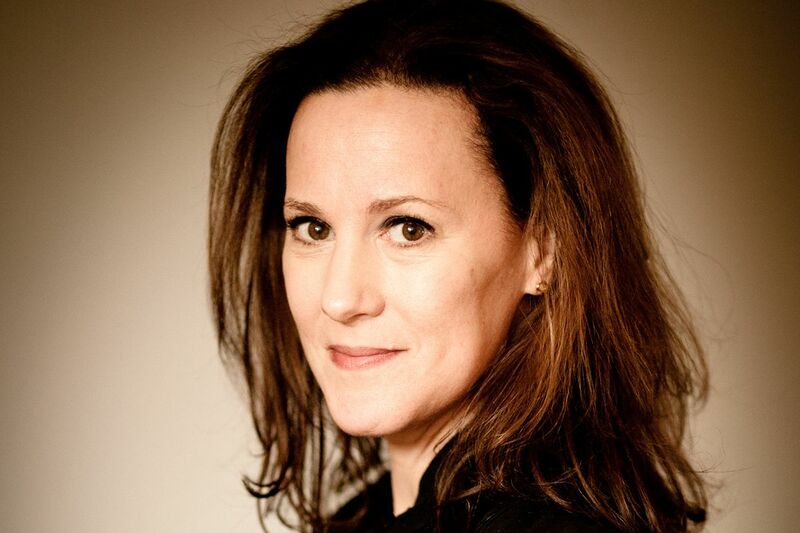 The Price Per Wear of my 7+ year old grey jersey Max Mara Weekend blazer (almost like a sweatshirt material) is down to pennies. It's looking dingy but I can't part with it. It's perfect. How will I ever replace it? 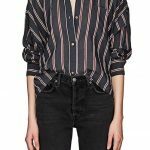 I purchased a similar sounding one from Rag and Bone, not too long ago – on sale! Really on sale. 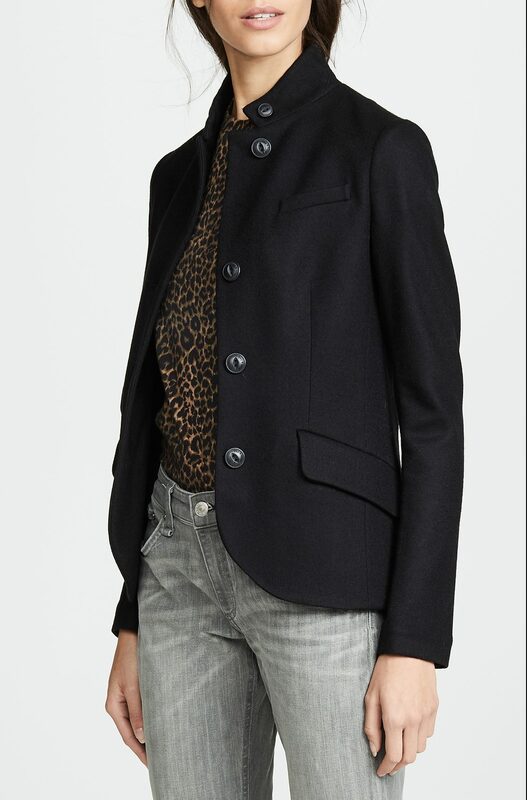 I purchased a similar sounding one from Rag and Bone, not too long ago - on sale! Really on sale. Really love your choices, Kim, particularly the Veronica Beard. So many great options from Shopbop but alas, the 25% off sale just ended 😱😱 Would love your sale pics next time! I know, I totally flaked the Shopbop sale this time around. Profuse apologies. 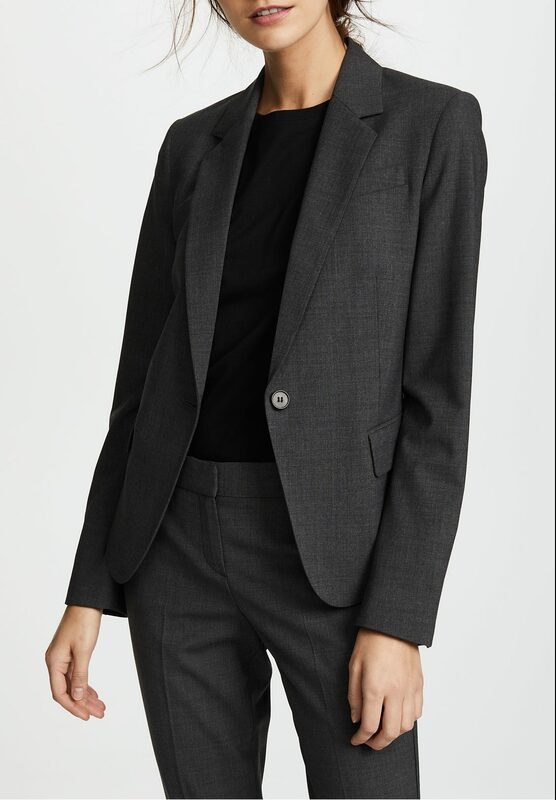 The outfit in the Theory blazer photo is precisely how I dressed when I was in the corporate world — a subtle suit with a black top. And killer shoes or boots. I really, really miss that part of working in an office. 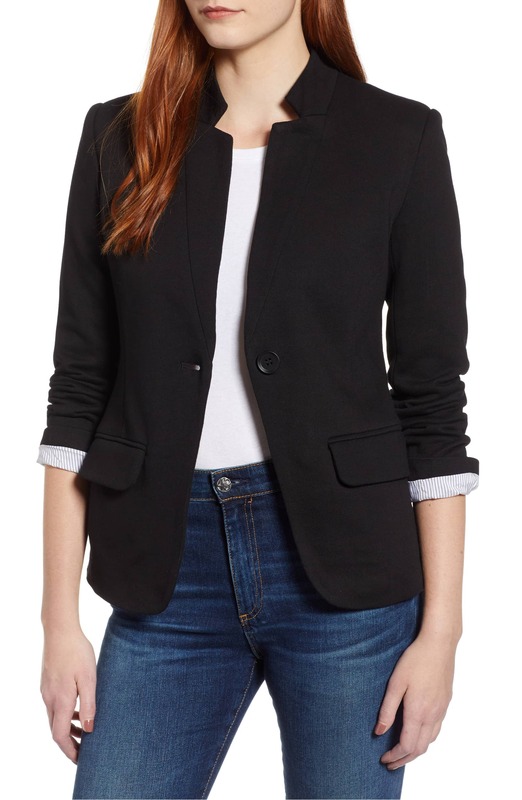 The outfit in the Theory blazer photo is precisely how I dressed when I was in the corporate world -- a subtle suit with a black top. And killer shoes or boots. I really, really miss that part of working in an office. And I drooled over the Rag and Bone blazer the first time you posted it, too. Sigh. Yup – I may just do it come fall that’s when I splurge – it would look darling with jeans and just about any shirt. Yup - I may just do it come fall that's when I splurge - it would look darling with jeans and just about any shirt. That crazy check one really got my attention this morning. What fun and I know no one else in Iowa would have one. I used to have a red blazer that I wore all the time, no idea what I did with it. And I am digging the Elvis tee under the silk blazer. I went right to the Madewell one thinking it’s perfect for me, only to discover that I already own it! I went right to the Madewell one thinking it's perfect for me, only to discover that I already own it! 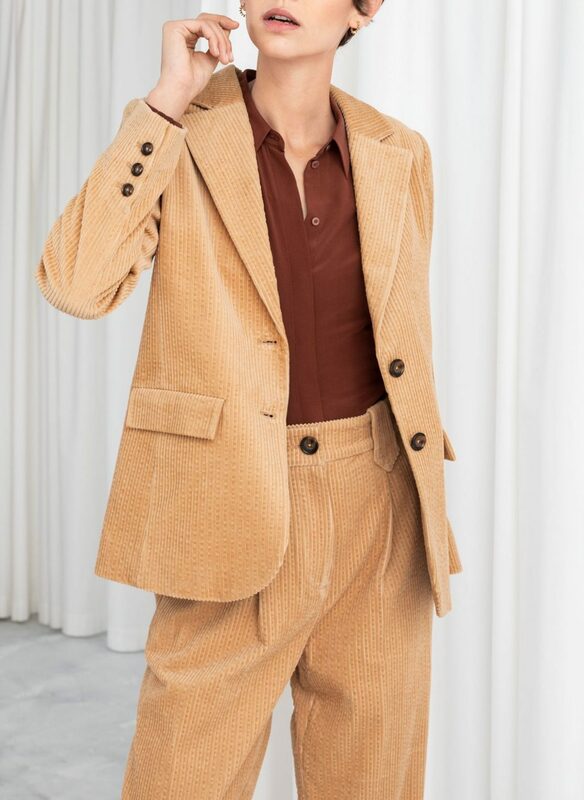 For people who have the means to spend over 400 USD for a blazer off the rack, definitely considering getting one from a tailor. For the same price range (the fabric choice will determine the final price) a tailor-made blazer will fit you infinitely better than anything from the store regardless of designer. 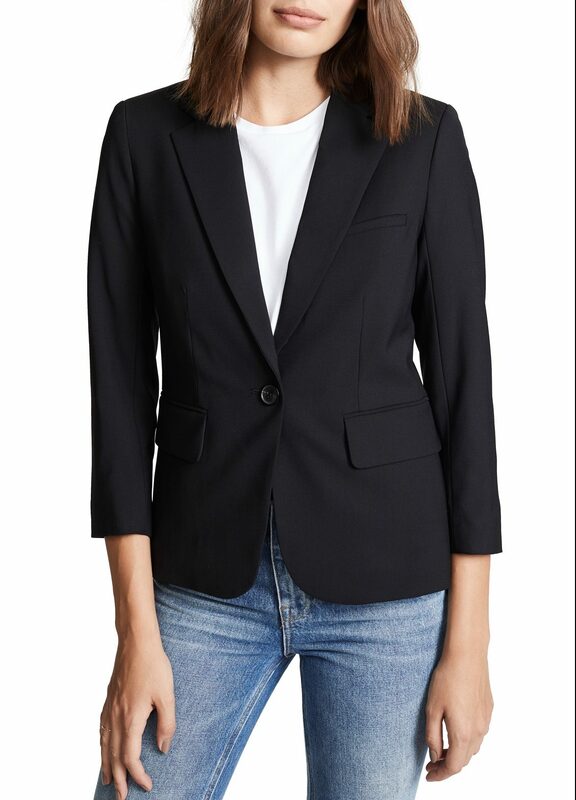 Absolutely love a blazer: I looked at my closet and realised that I own close to 10 black blazers of various shapes and cuts. Now I need to push myself to get some non-black ones…. I think that pattern is called houndstooth.